The picnic blanket is a staple point of any outdoor meal, which is why it's crucial to make sure your picnic blanket fits the bill. Mega Mat produces a number of attractive picnic blankets in a variety of sizes. Lightweight and easy to transport, picnic blankets from Mega Mat are also waterproof, ensuring that you don't have to worry about the discomfort of damp grass soaking through. Not just reserved for picnics, Mega Mat blankets are also ideal for other outdoor activities, such as camping, concerts or lounging on the beach. And don't forget, every Mega Mat blanket is backed by Picnic World's 30-day money back guarantee, so you can be confident you'll get a blanket with the quality you're looking for. The oversize blanket was perfect for all of us at an outdoors concert. We haven't had this product for long, so I can't speak to how long-lasting it is, but it is very functional. I like the print (a darker plaid, Blue Bayou, in order not to show stains! ), the waterproofing worked great on some wet grass, and I love the way it folds up into a very manageable size with its own strap to carry it with. This handsome picnic blanket was a perfect choice for my brother's camping trailer! 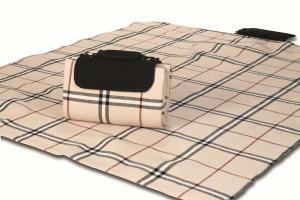 Great quality and multifunctional too...when not being a perfect picnic blanket it resides as a bedspread. He was very pleased with the gift! This handsome picnic blanket was a perfect choice for my brother's camping trailer! 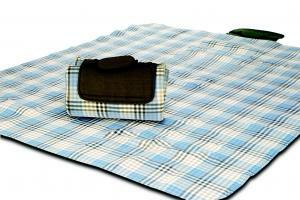 Great quality and multifunctional too, when not being a perfect picnic blanket it resides as a bedspread. He was very pleased with the gift! Great item, good size, bright color, rolls up neat and easy. Great buy! This was a great investment. We love the blanket and it is perfect for the park and very comfortable! This blanket is great for picnics. I love it.